At an Ostara celebration I attended last year, one of the rituals we did was make seed bombs. [Google it] Participants were given a small plastic baggie into which we scooped a big tablespoonful of red clay dirt that had carrot, radish and kale seeds mixed in it. We watered the dirt with a garden mister and used the bag to form it into a ball. We were then told to let these balls harden for about 24 hours. Participants were encouraged to toss their ball onto any patch of ground that needed something to grow on it. Suggestions were made such as an abandoned lot, a park, etc. The idea is that once the seeds germinated there would be food produced for animals and humans to eat. I thought it was a creative idea. 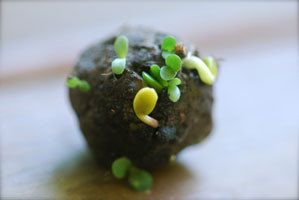 Seed bombs could also be used for Earth Day celebrations. I would be inclined to mix native wildflower seeds into the dirt to add a little color to your neighborhood as well as provide a source of pollen for bees and butterflies. It’s a cool idea rich with symbolism and meaning. It’s also a creative way to love our planet. Happy Ostara everyone! This entry was posted in Creation Spirituality, Ostara and tagged Ostara, Spirituality, Wicca. Bookmark the permalink.